A Gurgaon-based music academy organised a musical memorial to pay homage to late Prime Minister Lal Bahadur Shastri on his 111th birth anniversary and commemorated the golden jubilee of the slogan “Jai Jawan Jai Kisan”, on Saturday at Epicentre in Sector-44. 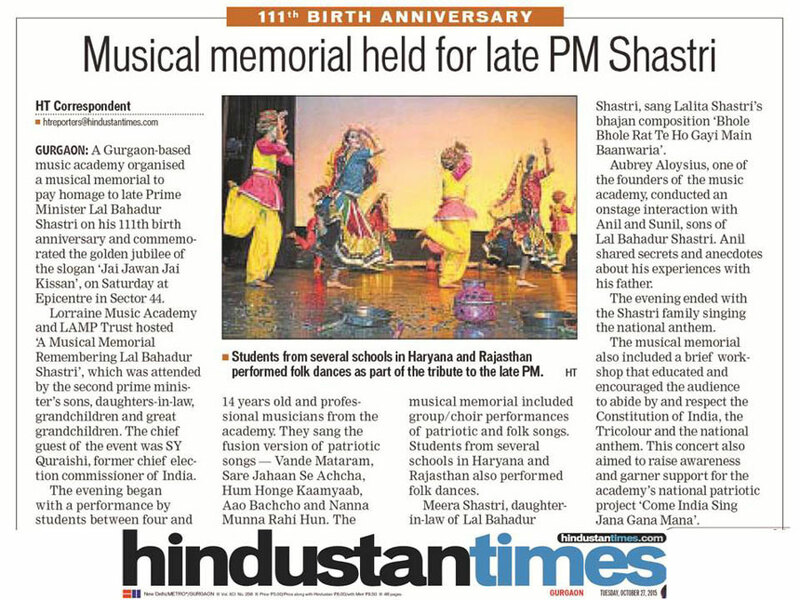 Lorraine Music Academy and LAMP Trust hosted “A Musical Memorial Remembering Lal Bahadur Shastri”, which was attended by the second prime minister’s sons, daughters-in-law, grandchildren and great grandchildren. The chief guest was SY Quraishi, former chief election commissioner of India. The evening began with a performance by students between four and 14 years old and professional musicians from the academy. They sang the fusion version of patriotic songs – Vande Mataram, Sare Jahaan Se Achcha, Hum Hinge Kaamyaab, Aao Bachcho and Nanna Munna Rahi Hun. The musical memorial included group / choir performances of patriotic and folk songs. Students from several schools in Haryana and Rajasthan also performed folk dances. Meera Shastri, daughter-in-law of Lal Bahadur Shastri, sang Lalita Shastri’s bhajan composition ‘Bhole Bhole Rat Te Ho Gayi Main Baanwaria’. Aubrey Aloysius, one of the founders of the music academy, conducted an onstage interaction with Anil and Sunil, sons of Lal Bahadur Shastri. Anil shared secrets and anecdotes about his experiences with his father. The evening ended with the Shastri family singing the national anthem. The musical memorial also included a brief workshop that educated and encouraged the audience to abide by and respect the Consititution of India, the Tricolour and the national anthem. This concert also aimed to raise awareness and garner support for the academy’s national patriotic project “Come India Sing Jana Gana Mana’.